G'day! Welcome to Partake and the last in our series "Scriptural Delights!" As a way of concluding, let us take a look at what some people have said about this Psalm. We are going to engage with the minds of Augustine, John Calvin, Charles Spurgeon and CS Lewis: and they will give us some insight into this magnificent Psalm. Augustine - "You will not labour long in listening to it, nor will the labour you devote to practicing it be without fruit. As its title indicates, it is a "song of steps." Steps are either of ascent or descent, but as used in these Psalms, steps signify an ascent. Let us understand them, therefore, as ascending steps, and let us not seek to ascend with our feet and in a carnal manner but as suggested in another Psalm: "He has prepared ascents in his heart, in this valley of tears, in the place which He has fixed" (Psalm 83:6-7). Where then are these ascents? In the heart. From what should we ascend? From the valley of tears. In designating the place, the human tongue somehow fails us; one knows not how to speak of it nor even to think of it. You have previously heard this passage of St. Paul, that "eye has not seen, nor ear heard, and that it has not entered into the heart of man" (1 Corinthians 2:9). If it has not entered into the heart of man, then the heart of man ascends to it. There- fore, if "eye has not seen, if ear has not heard, if it has not entered into the heart of man," how are we to say where we should ascend? So in his powerlessness to say where, the Prophet says to us: "To the place fixed." John Calvin - "Two things which the prophet mainly aims at; the exhorting of the children of God to follow godliness and a holy life; and the prescribing of the rule, and pointing out the form of the true worship of God, so that the faithful may devote themselves wholly to the study of the Law. Along with these he frequently blends promises for the purpose of animating the worshippers of God to live more justly and piously; and, at the same time, he introduces complaints respecting the impious contempt of the Law, lest they should become tainted by bad examples." Charles Spurgeon - "This psalm is a wonderful composition. Its expressions are many as the waves, but its testimony is one as the sea. It deals all along with one subject only; but although it consists of a considerable number of verses, some of which are very similar to others, yet throughout its one hundred and seventy-six stanzas the self-same thought is not repeated: there is always a shade of difference, even when the color of the. thought appears to be the same". He then goes on to say "I admire in this psalm the singular commingling of testimony, prayer, and praise. In one verse the Psalmist bears witness; in a second verse he praises; in a third verse he prays. It is an incense made up of many spices; but they are wonderfully compounded and worked together, so as to form one perfect sweetness. The blending greatly increases the value of the whole. You would not like to have one-third of the psalm composed of prayer - marked up to the sixtieth verse, for instance; and then another part made up exclusively of praise; and yet a third portion of unmixed testimony. It is best to have all these divinely-sweet ingredients intermixed, and wrought into a sacred unity, as you have them in this thrice-hallowed psalm. Its prayers bear testimony, and its testimonies are fragrant with praise." CS Lewis : "Everyone has probably noticed that from the literary or technical point of view, it is the most formal and elaborate of them all. The technique consists in taking a series of words which are all, for purposes of this poem, more or less synonyms, and ringing the changes on them through each of its eight-verse sections - which themselves correspond to the letter of the alphabet. In other words, this poem is not, and does not pretend to be, a sudden outpouring of the heart like, say, Psalm 18. It is a pattern, a thing done like embroidery, stitch by stitch, through long, quiet hours, for love of the subject and for the delight in leisurely, disciplined craftsmanship. Now this, in itself, seems to me very important because it lets us into the mind and mood of the poet. We can guess at once that he felt about the Law somewhat as he felt about his poetry; both involved exact and loving conformity to an intricate pattern." A friend of mine, Sharona, commented to me about Psalm 119! This is her memory of the great Psalm! Years ago, I gave my boss a Bible. He had been telling me that he had never owned anything but a KJV and didn't understand it at all. I gave him a hardback NIV pew Bible. He put it in his desk drawer but never looked at it. One day I went into his office to find him shuffling through the pages of the Bible, clearly looking for something. I asked if I could help and he told me he had been watching a football game and someone held up a sign that said "John 3:16" so he was trying to find out what it said. I helped him find the verse. Then he closed the Bible, opened it at random and read aloud, "Your word is a lamp to my feet and a light for my path" and I said "Psalm 119:105 !". He looked at me in shock, and with sheer admiration in his voice said, "Oh, you're good!". Then he closed the Bible, opened it at random and said "Let's try again!". Then he read a verse I had no idea where it came from, but it sounded a bit like it could have been Isaiah. I said tentatively, "Isaiah?". He said, "No, think bullfrog..." And I said "Oh, Jeremiah!" and we both had a laugh about that. OK, it's random, but I have a laugh about that every time I think of that happening, him thinking I was such a brilliant biblical scholar, because I knew a verse from Psalm 119. Thanks for that, Sharona - terrific story! For Spurgeon, It is portrays a sacred unity, whereby prayers, testimony and praise intermingle, intermix and form a sweet incense! Psalm 119's prayers bear testimony, and its testimonies are fragrant with praise. What is it for you? Have you considered scripture as being like an elaborately intricate staircase to ascend, so that you can get to know your God more, in order to live a life worthy of him as your prayers bear testimony and your testimonies of God's goodness bear the fruit of praise? G'day! Welcome to Partake and our continuing series "Scriptural Delights!" Here is our twenty fourth podcast going through the wonder that is Psalm 119! Today we look at the twenty second of its twenty-two sections, Taw, and it is verses 169 to 176. Sharona is reading it for us today! Thanks Sharona! Once again, in verse 169, David the Psalmist repeats his inner desire to understand God's word, law, decrees, statutes and wisdom! He is full of zeal for God and is earnestly yearning His God to reveal His promised wisdom and understanding to him. The Psalmist is in a relationship with God and seeks to get to know His God better and God has promised him that He will pass on wisdom to David through the law and the scriptures. God will enlighten His servant, the Psalmist, because He has promised to, and He who has promised is faithful to honour those promises. The Psalmist greatest desire is to understand the mind of God, developing his relationship with Him and to be guided by Him! The Psalmist desires that every facet of his life be guided by his great all-knowing and all-powerful God! And now in verse 171, he is overflowing with praise! He is effervescent with praise, overflowing, bubbling over and ecstatic with joy for His God! The reason for this exuberance is that he wants to be imbued with heavenly wisdom as taught through the decrees and statutes of Almighty God! It gives the sense of a spontaneous outburst of praise just exploding from the Psalmist like spring water bubbling from the desert sands! Having been taught by the Lord in the practise of righteous obedience to the Law, the Psalmist is intent on teaching others! He is passing on to others, the wisdom he has learned and received! The sense here is of corporate singing of exultant choral praises of God or an echo of the angels singing of God's awesome majesty, beauty and holiness! Continuing, the Psalmist entreats God to personally help - nor my friends or your friends, O God - but you and you alone! Give me your hand O Lord and I will be rescued! Friends may let me down, discourage and betray me - but you O great God will never do that! Personally save me, the Psalmist is crying! By choosing God's precepts, the Psalmist has dedicated himself to obeying his God and following Him closely. The Psalmist was keen to be found in full obedience to his God. And he yearned for full salvation from his God - he had tasted it in part before but was waiting for it to be complete, as if in expectation of some form of greater salvation. He had been saved from his enemies, those who betrayed him and from wild animals. His present salvation was assured as God had promised him, but so was a future salvation, a salvation of his soul! Hence, there is his longing to delight in all of God's words and works. This future salvation of the soul, filled with life, preserved so he may praise God! God's judgments sustained and helped the Psalmist! Seeing God at work in his life gave him a hope - a hope that promised a future praising God for all God has done, is doing and will continue to do! God's judgement helped the Psalmist to live an obedient life and a life that was close to God, walking and talking with Him! Then finally, we have the climax of the Psalm! There is almost an urgent need to be fulfilled. The lost sheep needs to be found, to be preserved and to be delivered. For all his knowledge of Scripture, his obedience to God and his own righteousness - the Psalmist knew that it was only because God had promised to find him that he would be saved. He was relying on God to assure him of the salvation of his soul. As a shepherd, he knew that if a sheep was lost, it was his job to find that sheep and restore it to the fold. So he uses this analogy, to symbolise his need of God's salvation. His own righteousness and obedience to the Law couldn't save his soul - only God could do that. God would seek him, find him and restore him. Here was the king, King David, recognizes his need to be a servant of God and wanting God to find him. He recognizes he needs to be obedient to God in response to being saved by God's grace and mercy. How about you? How are you doing in regards to your praise? Is praise bubbling from you like water from a living stream? Are you being fully reliant on God alone for the salvation of your soul and not trusting in your own righteousness, obedience or strength? God's grace and that alone is what saves you. Not God's love. Not God's mercy. But God's grace and that grace alone. What is your delight, your ultimate delight? Your delight should be in being guided by God in every facet of your life and being in a devoted obedient relationship with Him. Ask Him and he will help. Raise your hand and ask for help, just as Peter did when sinking in the water and Jesus rescued him. In response to this grace and the salvation that is yours assured, go and live a life of obedience to God - wherever that takes you as His servant. G'day! Welcome to Partake and our continuing series "Scriptural Delights!" Here is our twenty third podcast going through the wonder that is Psalm 119! Today we look at the twenty first of its twenty-two sections, Shin, and it is verses 161 to 168. Betty reads it for us! So over to you, Betty! Thanks Betty! That was great! We only have to read of David's life in the Scriptures to know that he had enemies and persecutors from all walks of life. He was betrayed by close friends and attacked by people from both those within his own nation and those outside it. Here the people that are persecuting him are princes. Princes usually protect the innocent and bring justice to the oppressed. Princes usually act with honour, decorum and nobility - but not these ones! No! These princes are out to cause David, the Psalmist, harm and without a justifiable reason! Committing perjury against him and threatening his life. And what is David's reaction? Is it to run and hide with fear and trembling from these persecuting princes? No! David's fear is not from mere mortal men! David's reverent fear is at God speaking! He is in awe of God's Word. Mere mortals may harm the body, but only God can harm the soul and therefore the Psalmist is not disheartened by persecution, oppression or injustice. And the reason he is in awe and reverent fear of God's Word is because it gives nourishment to him! He rejoices in the promises found! He has great joy at finding the treasures within God's written word! He values these treasures as more valuable than the spoils of war! The Psalmist fights for truth, battles for justice and feeds his hungry soul on all God's Word - not just his favourite parts! He loathes and abhors lies, perjury and false talk. They are bitter to him and a total contrast to the sweet honey of the Law and God's written Word. He loves it, feeding from it and gaining strength and nourishment - because it is solid Truth.. Resulting from this nourishment and this Truth, the Psalmist gains strength to be at prayerful praise during the day! This perfect God he sought to praise perfectly! When his perjuring persecutors came to mind, the Psalmist turned to praise and sang to the God of truth and salvation! He wasn't going to let these oppressive princes rob him of the joy of singing praise to his Almighty and righteous God! For he knows that God's laws are righteous and those that love God's law in obedience have great peace! This peace is not faltering as if built on sand! No! This peace is solid, reliable and true because it is based on God and His Law. Perfect peace for those who love God's Law and Words. Those that love God's Law are striving wholeheartedly to walk in obedience to God! When persecution comes, they have perfect peace, given by a God of peace. Because their peace is based on a God of perfect peace, they will not stumble or fall. While the Law was important and obedience to it produced from love, it could not provide salvation! Salvation could only come from the God and that through grace and grace alone. Because he had salvation assured, the Psalmist sought to show it by being obedient to God's commands and laws. This love he has for God's statues, testimonies and precepts is as a result of his great God saving, rescuing and redeeming him from all his enemies. The Psalmist, David, obeyed God's statutes because he both loved them, but also loved his God. He strove to show his love for his God by being obedient to Him! His outer life which people see is a reflection of his inner spiritual life. Despite the traumas, tribulations and tests that come his way, the Psalmist knows that his salvation is assured, because his God has promised him and God always keeps his promises. The Psalmist knows the mind of God through reading, studying, digesting and loving God's written word - it is the basis for his life of obedience to God. Cast your cares, burdens, and worries upon Him and let Him handle them. Let Him give you wisdom to deal and battle with those that seek to perjure and persecute you. Read what God has said in the Bible, follow it and obey it! Obedience, not as a means to salvation, because salvation can only be through God's gift of grace and that grace alone! Obedience to Almighty God is in order to reflect your inner peace with Him. Jesus said, "Love God and love others, for all the Law is summed up in those 2 commandments". Work out your salvation, as the Psalmist did, with reverent fear. Acknowledge God in all areas of your life and allow the Prince of peace to give you peace - peace in you, with you, on you and emanating from you! Seek the treasures in the Bible that are waiting for you to discover them. God is trustworthy, faithful and true! Don't just read your favourite passages, but all 66 books! It is worth it! Go in peace to love and server the Lord! Amen! G'day! Welcome to Partake and our continuing series "Scriptural Delights!" Here is our twenty second podcast going through the wonder that is Psalm 119! Today we look at the twentieth of its twenty-two letters, Resh, and its verses 153 to 160. Sharona reads it for us! Thanks Sharona, that was great! Once again the Psalmist is in danger of losing his life! He is seeking to be delivered from his pains and rescued! He is one of God's servants and seeks to show that by remembering God's law, God's words and behaving as one of God's servants, devoted in fear, reverence and love of Almighty God! And because he hasn't forgotten God's law, he pleads for God to consider and remember him. He is not so distracted by his own problems, that he has forgotten the beauty of God and God's Law! He is faithful to God, because he knows that God is faithful to him! His persecutors are surrounding him, circling with menace so the Psalmist asks for his God to be his advocate, his redeemer! The Psalmists enemies are spouting lies, ensnaring, oppressing and committing perjury against him, so he calls for his advocate and defender! He also asks that his Almighty God preserve him according to God's own promise. He knows that God always fulfils his promises to those who follow him. The promises of God are as a soft healing balm to the frustrations and wounds of the Psalmist. And while the Psalmist has a hope in his God, those who persecute, oppress and endanger him are bound for destruction! These wicked oppressors can never find salvation because they are removed from God, ignore God's decrees and commit blasphemous acts in defiance of God's decrees! The Psalmists persecutors are only interested in their own wisdom instead of seeking the wisdom of God. In contrast to these wicked people, the Psalmist has not strayed from God's righteous statutes! He knows Almighty God is compassionate, a great help in times of trouble and preserver of life - nothing can happen to the Psalmist unless God allows it, and God wont do that because of His tremendous promises found in His Law. The mercies of the Lord endure forever and ever - they are innumerable, immeasurable, immense, tender and true. When he sees the wicked persecuting oppressors disavowing God, actively being wicked in disobedience, the Psalmist is full of righteous indignation and loathing! In contrast to the unrighteous who are against him, is the Psalmist who loves God's precepts, commands and Law. He knows that the Lord's anger is slow to burn and that the Lord is quick to love those who actively follow him. All of God's words are true, all of God's laws are righteous, exclaims the Psalmist! All of them from beginning to end and from top to bottom! This was a man willing to stand up for God with zeal, passion and righteous indignation - even if it cost him his very life! How are you doing in your appreciation for what God has done for you? How are you doing when the world around through the media or people you know, seek to discredit your Christian belief in Almighty God? Are you sometimes filled with zealous indignation when Christians and Christianity are perjured against in the media or your workplace? Who is your advocate before God that defends you, wants to redeem you, deliver you from your enemies and those who would seek to bring you down and cause you to lose heart? As Christians, Jesus Christ is our advocate before God the Father. Do you know the promises of God, which can be found in the Bible? Read the Bible and when praying, have your Bible open and tell God what you are reading! All of Scripture, the Old Testament and the New Testament, is reliable and true- from beginning to end - just as the Psalmist exclaims for the portion that he had at the time. In doing so, you develop an intimacy with God the Father, through God the Son in the power of God the Holy Spirit who lives inside you! This engenders a love for all of the Bible and not just your favourite parts! Be prepared to worship God in all manner of styles and not just your favourite style. Yet sometimes we have those in the church who like to discourage, perjure and hyper-criticize. No need to go far to find other Christians perjuring and espousing misleading words against us - particularly in the area of worship! Too many Christians today are perjuring others, being one-dimensional in their acts of church worship, short in their bible reading and are living stunted Christian lives because of it. Just because another person experiences the Holy Spirit in a way different to you, doesn't invalidate that way, but rather reflects the unique way God the Holy Spirit is working in the life of that person! Rejoice when that other person is worshipping Almighty God, even if the style of worship is not your own particular choice! Don't restrict the Holy Spirit's activity in your own life and do not grieve Him by trying to restrict and criticise His activity in another Christian's life - to do is blasphemous and to call unclean that which is clean! Go and rejoice in the freedom of the Gospel for all people to worship in Spirit and truth and in many different styles - reflecting the manifold mercies of an ever-gracious God! A God who is gracious to save and merciful to be worshipped and adored! A jealous God worthy of zealous followers! G'day! Welcome to Partake and our continuing series "Scriptural Delights!" Here is our twentieth podcast going through the tapestry of wonder that is Psalm 119! Today we look at the eighteenth of its twenty-two letters, Tsadhe, and its verses 137 to 144. Thanks for reading, KD! - that was fabulous! The study tonight was written and recorded by my mentor and friend, Jim Harris. This is his 4th and last of his contribution to this series. Over to you, Jim! Hello, and welcome to another study in Psalm 119. It covers verses 137-144 and each line in the Hebrew text starts with the letter ‘TSADHE'. The very first word in the NIV translation introduces the dominant theme in this stanza. It's about God and things being ‘right' or ‘righteous'. Cast your eyes over verses 137, 138, 142 and 144. Then, looking at them more closely, we get to see something like this. v137. God is righteous. ‘Righteous are you, O Lord. This may be understood in terms of God's relationship with his people. He keeps his promises. He provides for their needs. He is faithful in all his deeds and ways. He always does what is right, for God cannot deny himself; God cannot lie; God cannot break his word, once given. Verse 140 reads, ‘Your promises have been thoroughly tested, and your servant loves them.' God is righteous. He's consistent. If that is true, then what flows from God is also righteous. Verse 137 again, ‘You are righteous, O Lord, and your laws are right.' God gave his Law through Moses. The detailed laws within it were designed to shape the crowd of people who escaped from slavery in Egypt, into a coherent nation fit to live in the Promised Land, where they would show the rest of the world what the LORD was really like. At least, that was the intention, but its working out fell short of God's wishes, because his people were not altogether co-operative. v138 has a similarly high view of God's statutes - another word describing the detail of God's Law. ‘The statutes you have laid down are righteous; they are fully trustworthy.' They flow from God, therefore they are as dependable and effective as God himself is. If God said it, then you can rely on it. So, that is the thrust of this passage for those of us who have committed our lives to Christ and are listed among his people. We have the word of God to a much greater extent than the psalmist did, in that we have both Old and New Testaments. If we don't have an appetite to read and hear it, ask the Holy Spirit to make us hungry for it. If our lives are being shaped mostly by influences drawn from this world in which we live, let's open ourselves up to the Lord through Scripture, and ask the Holy Spirit to use it to make us more like the Lord himself, to whom we owe everything spiritually. If our reading of life's negative experiences causes us to doubt the goodness and love of God, let's soak our minds in the glorious truth of a passage like Romans chapter 8. If we have doubts about our salvation let's give ourselves, this Easter, to reading in the Gospels the four accounts of Jesus death and resurrection. And so the list could go on, but it's time to close. I leave you with one of Scripture's famous 3:16s - Colossians 3:16, ‘Let the word of Christ dwell in you richly.' The Lord be with you. G'day! Welcome to Partake and our continuing series "Scriptural Delights!" We should have been looking at the eighteenth letter Tsadhe (ts-th) but Jim Harris is unable to do that for a couple of days. Here is our twenty first podcast going through the wonder that is Psalm 119! Today we look at the nineteenth of its twenty-two letters, Qoph, and its verses 145 to 152. Sharona reads it for us! Thanks for the reading, Sharona - that was great! Here the Psalmist starts this section with two impassioned calls or loud cries! These are not necessarily loud audible cries but rather the inner desires of the heart and a bending of the will calling out to God. The first time is for God to hear him! His whole begin - body, mind and soul - are crying out go God, pleading with Him with full mental, emotional and spiritual energy. These are impassioned pleas. And the Psalmists knows that God will hear him, particularly if he is listening out for the Lord to speak, hence the being obedient to the decrees of Almighty God! Our Psalmist, David, is determined to live a life that is pleasing to God. To life a life that is worthy of being called God's servant. Not only was it impassioned prayer, but also it was prayer borne out of determination. He knows his need to be rescued, so he cries out to the one who can save him - Almighty God. As a result of being saved by God, the Psalmist pledges to be obedient to God the rescuer. The Psalmist promises to follow God's instructions and statutes in full obedience. Now for the third time, the Psalmist mentions that he has cried, pleaded, begged passionately for God. The Psalmist's prayers are frequent, intense and strong. So strong are his desires are that the moment he awakes, he is in prayer. A key element of his prayers is hope. Here the Psalmist David has put his hope in God and God's word. God is faithful, as the Psalmist has said throughout, and God's words are also faithful and true - they can be relied upon to encourage and give hope. So intense is his prayer life, that not only is he up early in the morning, but late at night he can be found to be mediating on the promises that God has made! The Psalmist's prayers were all day long! From before dawn till after dusk! He prayed to and worshipped His God all day and with great fervour and eagerness! He knows God will hear his voice, his pleadings as he maintains an attitude of hope, worship and adoration. And to reaffirm that, he knows that God is a great God of love and a God of great love! Here in verse 149, it's an audible prayer, not through any merit of his own, but of the merits of God! This God is loving, kind and preserver! This God fulfils the promises He makes! He gives strength in order to overcome the burdens faced by the Psalmist! When the Psalmist is faced with death, the God he serves, gives more life! WOW! The Psalmist doesn't concentrate on himself or his own voice, but rather on this God and His voice, particularly His voice as seen in the laws. He will be rescued before his enemies can kill him. These wicked people are the opposite of the Psalmist. Where the Psalmist is close to God, listening to God with open obedience and hoping in God's promises, the scheming enemies are far away from God, from God's laws even though they are near to the Psalmist. His enemies are only after mischief and troublemaking, not for the things of God! Yet as near as his enemies are, the Psalmist knows that God is even closer! His God is watching over him, to preserve, love and watch over. God's commandments are true, worthy of obedience and trustworthy. God is near, He is true and the Psalmist is safe. This loving and living God sees His servants under oppression and burdened and draws even closer to them to give them aid, assistance, comfort and encouragement. No wonder the Psalmist is keen to be obedient to his Worthy God! In verse 152, we get the idea that the Psalmist, David, is now an old man when writing this. Long ago in his youth, he learnt God's word and the stories, commandments, testimonies of God and those who followed God. The Psalmist built upon this rock, this established base and is seeking earnestly to live a life of utter obedience to this living God - a living God who does not and cannot change! WOW!! G'day! Welcome to Partake and our continuing series "Scriptural Delights!" going through the wonder that is Psalm 119! Here is our nineteenth podcast of the series! Today we look at the seventeenth of its twenty-two letters, Pe, and its verses 129 to 136. The bible reading is done by Sharona. Greetings! This study in the section associated with the Hebrew letter ‘PE' makes us consider the role of the word of God in bringing understanding to our minds, moral and spiritual direction to our lives, and heart satisfaction in our relationship with the Lord. To ease us into this, we look elsewhere in Scripture first. In Numbers 6:24-26, we read of the Aaronic Blessing. As the High Priest of the people of Israel, Aaron was instructed to bless them in the Name of the Lord. It's my feeling that this priestly blessing was in the psalmist's mind when he wrote this stanza, PE. ‘Turn to me and be gracious to me' (132). The NIV reads ‘have mercy on me.' Older translations use ‘be gracious' but it amounts to the same, as both words imply acceptance, forgiveness and peace with God. Then, in verse 135, he says, ‘Make your face shine upon your servant'. So, asking God to turn towards him, to be gracious to him, to make his face shine upon him? I'm sure you can see the connection between this Psalm and that Blessing. How is the Christian equivalent of that blessing conferred upon us today? It's done by the Holy Spirit through the word of God, the words of Scripture. Many church services include or conclude with these very words of Scripture, spoken as a ‘benediction' or ‘announcement of blessing from the Lord' upon his people. It also happens in our personal lives. As we read, believe, and respond to the wonderful words of God, we receive a rich blessing upon ourselves. The very first verse picks this up, ‘Your statutes are wonderful; therefore I obey them.' The last verse takes a different but related line, ‘Streams of tears flow from my eyes, for your law is not obeyed.' Here's a man who really does understand the way in which the Lord confers his blessing upon his believing people, and grieves that there are those who profess to belong to the Lord but refuse to obey his word. Let's make sure that isn't true of any of us! Now let's see how God's word brings his blessing, as we explore these verses. It begins by bringing understanding. Verse 130, ‘The unfolding of you words gives light; it gives understanding to the simple.' By ‘simple' he is not describing those with what we would call ‘learning difficulties', but those whose understanding has not yet matured enough for them to be fully aware of God's will and ways. Where there's a willingness to learn about spiritual matters, the word of God will bring what the psalmist calls ‘light'. This is a process which combines insight and wisdom. We gain further insight into the Lord and his ways with humankind; into the realm of spiritual realities and experience; into the whole meaning of Jesus and his work of redemption; into what it means to live by the Spirit, and so on. We also receive the gift of wisdom, which enables us to apply what we know through insight to our lives in this world. That way we can live to the praise and glory of God. Finally, Scripture also enables us to enjoy heart-satisfaction in our relationship with the Lord. In verse 131 he is ‘longing for (the Lord's) commands' and describes himself ‘panting' like a thirsty animal. In 134 he wishes to be free from the force of human opinions and pressure, so that he can respond fully to the Lord. In 135 he is looking for a shining sense of God's presence, as he responds to what the Lord shows him in his word. This is the language of a truly devotional life; a servant of God who wants to walk closely with the Lord and to enjoy his presence. G'day! Welcome to Partake and our continuing series "Scriptural Delights!" Here is our eighteenth podcast going through the wonder that is Psalm 119! Today we look at the sixteenth of its twenty-two letters, Ayin, and its verses 121 to 128. Hi there! This is Jim Harris sharing some ideas with you from the 16th section of Psalm 119, in which all the verses begin with the Hebrew letter ‘AYIN'. Three times in these 8 verses you'll find the words ‘your servant'. They are in verses 122, 124 and 125. That gives a flavour to this section of the psalm. He knows that he has been called in his personal life and, probably, in a public role to serve the Lord. He feels the cost of doing that and appeals to the Lord for help in various ways. All true believers in Jesus today are called to serve the Lord. It begins with simply the way we live. That means that our lifestyle, our priorities and our values about what is right and wrong, will often bring us into conflict with people living and working around us. Should the Lord call us into a specific role in serving Him, in our local church perhaps, or in the wider world through a Christian mission or agency, the pressure will come in a different way, from those who object to the work we are doing in the name of Christ. Like the psalmist we, too, must turn to the Lord for his comfort and strengthening in the situation. In the first two verses here, he is concerned for his own well-being. ‘I have done what is righteous and just; do not leave me to my oppressors. Ensure your servant's well-being; let not the arrogant oppress me.' He is suffering from ‘people-pressure' and he's not too keen on it. But we take note of the fact that he's not engaging with them in a war of words but, rather, he's turned to the Lord with an urgent plea for His help. He's resorted to prayer, rather than to disputation, as the best way of dealing with the problem. That's a good example to follow. Our arguments will tend to harden people in their opposition. Sometimes it will even give them some satisfaction to know that they've got to us. Like Jesus before his enemies, we will find that being silent before them but verbal towards God is usually the best way of handling the matter. After all, the Spirit of God can reach those parts in people that none of us can get to! As we move on, it's clear that he is being called to endure, to keep going, while the Lord is actually handling the situation for him. God's timing and the servant's wishes do not coincide. The Lord seems to be hanging about - why doesn't He get on with it? ‘My eyes fail, looking for your salvation.' And, in verse 126, a wake-up call to the Lord, ‘It is time for you to act, O Lord!' His impatience, on the one hand, is due to his humanity. He's sharing with us the stress we all feel when our prayers are not being answered with the degree of urgency we feel the case merits. On the other hand, he has a genuine concern, that those who profess to be God's people are actually flouting - breaking - His Law. Now, whatever happens, or doesn't happen to him personally, surely that situation needs to be addressed! So, in verses 127-128 we read, ‘Because I love your commands more than gold, more than pure gold, and because I consider all your precepts right, I hate every wrong path.' That kind of love for the Lord and his word runs through the whole of this challenging psalm. In fact, it will be found everywhere in Scripture. Devotion to the Lord is expressed by a desire to live His way and to please Him. The Apostle Paul prayed for the Christians at Colosse that they might, ‘live a life worthy of the Lord and please Him in every way.' You'll find that in Colossians 1:10. Read Romans 5:1-8 when you can, and let the Holy Spirit bring home to your heart the tremendous truth of God's love at work for you, even in the most difficult of circumstances. G'day! Welcome to Partake and our continuing series "Scriptural Delights!" Here is our seventeenth podcast going through the wonder that is Psalm 119! Today we look at the fifteenth of its twenty-two letters, Samekh, and its verses 113 to 120. Thanks again for reading, Sandy! Just as he is single-minded regarding God, obeying God and keeping God's law, so there are others who are unstable and are in two minds about how to act! The Psalmist compares the stability and reliability of God's word with the instability and fluctuations of those who are unstable in their commitment to God and God alone. Even his own thoughts when he strays, are the product of a mind that is having wayward thoughts. The Psalmist knows that only God's word and God's wisdom can provide a solid basis for making decisions, whether moral, private or public. We get the sense that he is fighting a battle within himself, to control his thoughts and thinking patterns - that when his old ways of thinking habitually take over, he hates it. He goes on to cry out to God that God alone is his rescuer, refuge and protector! He cannot rely on his own intellect and man-made wisdom to do that for him, but rather, he relies on God's word and God's wisdom to reveal God as his protector and shelter! Then in verse 115, we see that he has a battle not only within himself, but also those who would seek him harm. These people are taunting, tempting and seeking to destroy him. Perhaps they are mocking him for his belief in God's words and wisdom, which is why he retorts by saying he wants to keep the commandments of his protecting God. With God at his side, the Psalmist knows that no harm can come to him. He has a personal relationship with this God and the Psalmist seeks to follow closely. The taunts of his enemies are nothing and the Psalmist takes refuge in the wisdom of His All-knowing God. His God has promised to sustain him, maintain his life! The Psalmist has put all his hopes in and on this great God whom he desires to know more and more. He knows God's promises are true, unlike those made by his enemies. God will not forsake him, even when all other people do. When he is in trouble, to whom does he turn? Does he turn to his enemies and surrender? Does he rely on his own wisdom and guile to escape the clutches of those who would do him harm? No! The Psalmist knows that God Himself will deliver him from the clutches of evil, and that by paying regard to God's decrees and God's wisdom, there will be an escape for him! He doesn't want to obey mere man but rather be obedient to this great God whom he loves, cherishes, adores and has promised to deliver him from evil and those who do evil! Those who reject God and God's ways, will be rejected by God Himself! They are living a life of deceit, double-mindedness and fluctuating morals - God will reject them because they have paid Him no heed. They have relied on their own wisdom and guile to survive - but not for much longer! For the Psalmist knows that this God rules the earth and all those who do wicked and are not in relationship with Him, will be lost forever. The Psalmist knows that it is by his God's twin actions of mercy and grace that he will be delivered and because he loves this God, he also loves all that God has commanded to be done. He is in fear of this awesome, all-powerful God and is in awe of the wisdom given in the laws and commandments of this God. Those that rely on their own wisdom, own imagination, own power will be as dust in the wind - but those that fear the Lord, accept His wisdom and commandments, will be delivered, rescued and be alive forever - just like the Psalmist says! I don't know about you, but I face a constant battle to be obedient to God and His wisdom. When we are tempted to sin, we are given two choices - either sin or not sin. We hop from one leg to the other, not knowing which leg to stand on. By continuing to ponder the temptation, we fall into a double-minded state. We can choose to either obey God or disobey Him. Our 3 enemies surround us: satan, the world and our old nature. We are to be over-comers of these enemies and not in our own strength, wisdom or guile. If we put our trust in anybody or anything but God the Holy Spirit to help us overcome the temptation to sin, we will fall into that trap of double-mindedness that the Psalmist talks about. We too will then be jumping from one leg to other, not knowing how to stand. We can overcome our enemies and temptations by asking God the Holy Spirit to help us escape the trap and by also having a reverent fear of God. Fear of the Lord is the beginning of wisdom cries the writer of Proverbs. It is a fear borne out of respect rather than dread. It is a fear borne from being in total awe! So lets go, not hopping from one leg to the other or from one thought to other, but rather get to know God's word intimately, be stable in your thinking and in your fearful desire to please this awesome God of grace and mercy, who delivers, rescues, protects and shelters! And it is in this God, that I take rest in my new nature given to me when I became a Christian and letting Him fight the battles for me. Thank you. G'day! Welcome to Partake and our continuing series "Scriptural Delights!" Here is our sixteenth podcast going through the wonder that is Psalm 119! Today we look at the fourteenth of its twenty-two letters, Nun, and its verses 105 to 112. If the last section was about Spiritual ecstasy, then this one is about Spiritual joy, and we will progress to see what brings the Psalmist spiritual joy! As he walks in the darkness with a lamp to show him where to tread and which path to follow, the Psalmist here is reflecting on just how God's word leads, guides and keeps him on the path of staying right with, and obedient to, Almighty God. Many is the path the Psalmist would have trodden in the dark when tending sheep when he was a shepherd boy, being careful not to fall into any holes. Now, he says just how brightly shining God's word is, to guide, steer and keep him on the narrow spiritual path! The light of Scripture and God's Law, commands and statues not only give guidance on how to live, but also direct and guide every action! God's word, says the Psalmist, is a light and lamp through the dark time he spoke of earlier. The tiniest light affects even the darkest night. It would also have been after having renounced all earthly wisdom that the Psalmist David could be guided by heavenly wisdom seen in the Law! With a lamp to direct his footsteps and a light to guide his path, the Psalmist resolved boldly before God, that he will follow the righteous laws as laid down. The lamp and the light are to show God's moral guidance! They are to show a way forward and not backwards! By going backwards, the Psalmist knows he will fall into darkness and ways that are disobedient to God! So he relies on the Law and God's commandments to show him the way up the narrow path of obedience to God. He offers himself to the service of God and is willing to fully committed to following where God leads and be obedient to Him. With his desire to keep God's laws, the Psalmist is embracing what God commands wholeheartedly and single-mindedly. And how does he achieve this? Is this achievable by using his own strength and guile? No! its due only to God's grace and power that the Psalmist can hope to achieve his goal and fulfil his oath. He knows that even though he suffers for his obedience, the Lord has promised to save and rescue him, according to His promises! Again, the Psalmists relies on God's promises to save, secure and rescue him. In response to be rescued the Psalmist offers praises and a willingness to be taught! With praises of a teachable person, God is asked to accept the Psalmist' sacrifice. Nothing was more important to the Psalmist than to know how God wanted him to behave in all situations and God's laws, statutes, precepts and commandments enable the Psalmist to exercise Godly obedience in all situations - both private and public. He has sought to do this, despite sufferings, persecutions, having his very life threatened and being in constant danger of his enemies. Despite all that, God's laws are imprinted on the Psalmist's heart and engraved on his mind - he does not forget! He is then able to overcome the traps, lures, snares and temptations laid out in wait for him, by his enemies. Knowing God's precepts on his heart and mind, allow the Psalmist to avoid such traps, shining the lamp and light of God's word on the path ahead. His persecuting enemies seek to destroy and kill him, but they are eluded by the Psalmist Godly guile and knowledge. For the Psalmist knows that God's laws are everlasting to everlasting and they bring him true joy. The testimonies he has read in the history of his people about how they overcame in order to be obedient to God are a joy to him. Provided the Psalmist possessed this everlasting joy, he could leave all other pleasures such as music, gold, jewels, riches, honours, wealth and family behind. God and being obedient to God through God's laws were the Psalmists utmost joy and goal - with a lamp and light to show the way forward! How is your lamp showing? How is your walk of obedience to, and service of, God going? It is when we are struggling with temptations and sins, that we need the Holy Spirit to help us overcome. So often, I know, we try in our own strength to overcome temptations and fail. We succumb to the tempters traps and disobey God. Much to the pleasure of our goading enemies. Jesus when in the last night before his arrest, trial and death, endured supreme temptations to just give up. But He didn't, because like the Psalmist, His supreme joy was found to be obedient to the Father! Where is your supreme joy found? Is it found in your wealth, possessions, sexual activity, friends or family? Or is your supreme joy, like the Psalmist and Jesus, found in obedience to God and service to Him and His people? Remember that we have a helper who dwells inside us - God the Holy Spirit! He will help you through temptations and snares and give you the grace freely to do so. Finally, when you do sin, having fallen for the lure or trap of the enemy, then be quick to ask forgiveness for your sin. The longer you leave it, the more it will fester, turn poisonous and gives the enemy, satan, an opportunity to accuse you. Ask forgiveness from God, accept His grace, move on and ask the Holy Spirit to fill you anew and help you. Read Psalm 51 and Psalm 32 if you want to know how the Psalmist did it! Remember, that temptation itself is not a sin - even Jesus was tempted many times and yet He never sinned! Thank you. 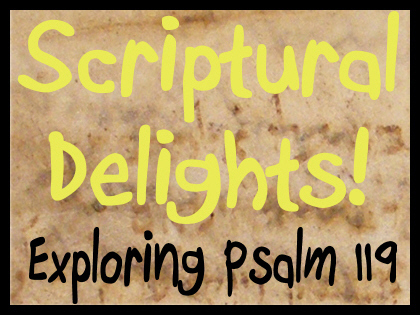 G'day and welcome to Partake and our series "Scriptural Delights!" Here is our fifteenth podcast of our series going through the wonder that is Psalm 119! Today we look at the twelfth of its twenty-two letters, Mem, and its verses 97 to 104. Here the Psalmist declares his love for God's commandments, law and wisdom! It's now not merely delight but he has moved on to a kind of spiritual ecstatic love! So much so, that the Psalmist meditates on God's law all the time, letting what God has revealed in His written word to permeate the Psalmist's whole thinking! And of course, meditating in this sense is not just sitting around and thinking - meditating in the biblical sense is always focussed on God and then acting out what has been learnt from God! The Psalmist knows that action has its beginning in the thought process and is the culmination of meditating. This action involves the Psalmist being wiser than his enemies! Because he relies on what God has said, and obeys what God has said, the Psalmist can avoid the traps of his enemies. The Psalmist knows that God will protect him! The Psalmist is endeavouring to live a life worth of His God - a life of total obedience and worship - so by having God's commands with him all the time, helps him achieve this twin aim. And its not only his enemies that he is wiser than - it is also his teachers! Its not that these teachers were fools - they were not! Its also not that they couldn't be trusted! They could! But the study of God's word and meditating upon it, leads to wisdom and fear of the Lord. He doesn't just accept what those around him and teach him say. He tests and approves their teaching in comparison with what he finds in the Law. Think not that the Psalmist is boasting, because he is not! Rather, he is accepting the teaching from God's word with a child-like desire to grow in knowledge and obedience of Almighty God. He builds up God and God's Law and not himself. This has also led him to be more obedient than his elders. God's precepts and commandments are a priority in the life of the Psalmist! He exudes ecstatic love for God and for God's law, precepts, statutes and commandments. And this ecstatic desire has produced dividends! The Psalmist feet have been on the path of obedience and right living! He is following God intimately! Every footstep he takes is carefully chosen so that his feet stay away from the paths of evil! Nothing could persuade or seduce him away from following God's path closely. So intimate is he with God's commandments and statutes that he has not departed from them! The path of obedience to God may not have been the easiest path for the Psalmist to take, but it was the right path because it showed obedience to Almighty God, the greatest teacher of all in verse 102! This intimacy of relationship between the Psalmist and God is sweet. The Psalmist loves to read the words of God and exclaims that it is even sweeter when he speak the words of God! While God's commands are to be sweet to the ears, eyes and intellect, it is only surpassed in sweetness when talked about and put into action. The Psalmist knew that if he only gained a head knowledge of obedience to God, then he would stray away from God, so he puts into practice in his life what God has taught him to do. This is for the Psalmist to live a life of total and utter obedience to the great God he worshipped and adored. Try as they might, his enemies cannot seduce him away from this obedience to his God! This life of total obedience to God, was mirrored in the life of Jesus Christ. Many times he was tempted to give in, walk the easy path and live a life unworthy of God. While we know the Psalmist, David, did sin, we know for sure that Jesus Christ did not. The life of Jesus Christ portrays an unparalleled intimacy with God and an ecstatic desire to be obedient to God. Jesus could have said no to the cross, but he did not. When Jesus Christ died on that cross, it was part of His total obedience to God. He could have given into Satan's temptations but we know that He did not. He had faith that His Father would raise him to life again 3 days later - and He was! Jesus was intimate with the Scriptures, as was the Psalmist David. How are you doing? Are there areas in your life where you are not obeying God and are being seduced away from Him? How is your intimacy with Him? Do you have an ecstatic relationship with the Bible, God's written word, as the Psalmist did? Why not pray and ask the Holy Spirit to develop this spiritual ecstasy within you, to read the Bible and follow it closely. So we wrap up with wise words from the Apostle Paul, writing in Ephesians 5v15-16 "Be very careful, then, how you live-not as unwise but as wise, making the most of every opportunity, because the days are evil."